When my kids were little, graham crackers were a staple snack food at our house. Hungry toddlers always seem to be satisfied with a graham cracker and half a banana, and a couple of crackers with peanut butter sandwiched in between is a perfect after-school snack. When it comes down to it, though, regular graham crackers are only a little better than cookies…full of bleached and refined wheat flour, sugar, and soybean oil. If you’re avoiding gluten, it can be hard to find graham crackers at all! 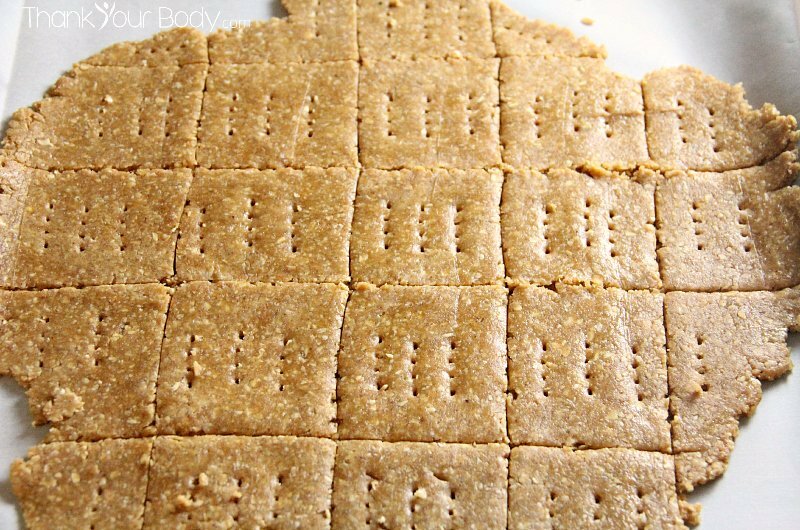 I accidentally came up with this recipe for high protein, gluten free honey graham crackers when I was experimenting with a cookie recipe, and I have really enjoyed having graham crackers around again. These honey graham crackers are made with just a few simple, healthy ingredients. Organic gluten free oat flour (make this yourself by running the oats through a food processor), peanut butter, honey and an egg are all you’ll need. Just mix everything together in a bowl, and then roll the dough out on a piece of parchment paper. Then, cut the the crackers into squares (you can use a pizza wheel for this). Bake them for a few minutes, and as soon as they are cool break the squares apart. There you have it! Protein-packed gluten free graham crackers in a jiffy. These crackers also work great when you need a graham cracker crust. If you want to have crumbs on hand for your next cheesecake or pie, just press the dough out on parchment paper and bake without cutting it into squares. When it’s cool, break it into chunks and run them through a food processor to make crumbs. You can keep the crumbs in a container in the freezer and use them as you need them. Gluten free honey graham crackers are great as a snack with peanut butter and a bit of honey, or a little cream cheese. Or, use them to make S’mores the next time you go camping! They’ll keep for a long time in an airtight container and they make a great addition to lunch boxes. Because they are made with peanut butter and oatmeal, these honey grahams will stave off hunger for even longer than the store bought kind! Kids love Graham Crackers... and now they can have them without you feeling guilty about how healthy they are. These are healthy and delicious. Line a baking sheet with parchment paper. Roll the dough out on the paper, about ¼ inch thick. Cut the dough into squares (a pizza wheel makes this easy). Prick each cracker with a fork. Bake the crackers for 7-10 minutes, until the edges begin to brown. Allow the crackers to cool. Break them apart and store in an airtight container. What’s your favorite way to eat graham crackers?